Just like most of the girls, I'm a big fan of beautiful shoes, heels and sandals as well - especially if they are sparkling, shiny and shimmery ones! 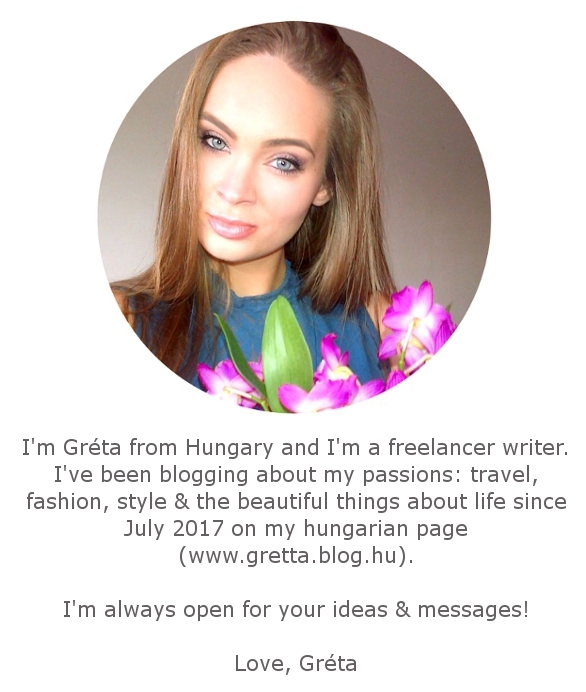 This time I collected my favorite pieces from the designer houses Spring/Summer 2018 collections. Which one is the best? 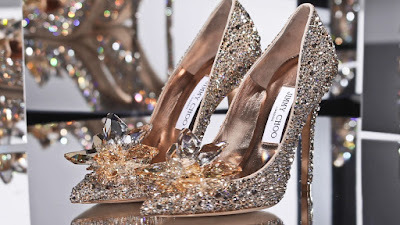 The famous Cinderella shoes are one of the world's most expensive ones: it's almost 4000 €, but for this price you can choose from various designs, color and heights too. If you own a pair from this, you can be sure that you have the most sparkling and shining heels ever, since they are decorated with luxurious Swarovski crystals. One of my big favorite is this purple Aquazzura heels, designed by the Colombian-born Edgardo Osorio. This 'Chateau 105' sandal have 11 cm heel and it's made from satin, metal, glass and leather. I think it's perfect for every type of event and because of the beautiful color and shiny rocks, the sandal easily completes every outfit from the simplest LBD (little black dress) to the most gorgeous ball gown. The price is 1131 €. I fall in love with this designer shoes like 2-3 years ago and since then I decided that I'm going to wear a beautiful sandal from René Caovilla for my wedding as well - at least that's the plan. This 11 cm jeweled heels are completely unique in this mint green color and every single details about it is made from Italian leather. The price is 1054 €. I know that the designer is famous because of the blue Hangisi pumps, but I love this one much more better! Firstly, this 10 cm Nadira pump is made from champagne silk satin and have a classic shoe silhouette decorated with Swarovski crystal elements. I think it's lovely and make any woman's outfit more elegant and beautiful. The price is 895 €. Can't make a secret about it: I love shiny things! This Emily heels are one of my favorite from Jimmy Choo's shoe collection and it's full of shimmering pinkish glitters and sequins. No doubt it would look amazing on anyone and also the heels are not that high: it's just only 10 cm. The price is 595 €, so it's cheaper than most of the designer shoes. 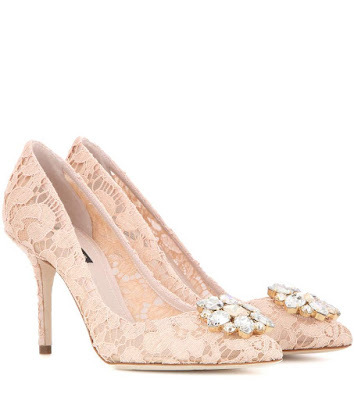 I think Badgley Mischka have one of the most beautiful shoes for brides. The brand's pieces are not so expensive, you can choose from variety of sizes and textures ans also, their heels are sparkling, shiny ones - I love almost all of them! It was hard to pick only one, but this Sabrina Ankle Strap Heels is one of the best for a wedding. The Italian luxury shoemaker made an exclusive collection to MyTheresa - this piece is one of the prettiest from it, and I also fall in love with the bright pink color and shiny metallic little stones on it! However the sandal is kinda simple, because it have nothing special on it, it became one of my favorite as well, because I don't like if the shoe is the only unique piece in my outfit. The price is 750 €. As much as I know, this 6.5 cm heeled Rockstud is not as much popular as the higher one, but I found it much more comfortable and wearable than the 2 strap one. It's really comfy however the best thing I love in it is the beautiful color (its a bit shiny, mine are light baby pink) and little metal rocks. I just wish they could designed it in gold instead of metallic one. The price is 740 €. I know I know... another pink, another sandal and another shiny one.. I can't help but I love it! I have to say, I'm not crazy about Gucci's new pieces (however I know its very popular nowadays), but this one kinda stole my heart. By far actually you can't really see that it's pink, because it's so shiny... it looks like a jewelled shoe but as you got closer you realize it's a piece of art. 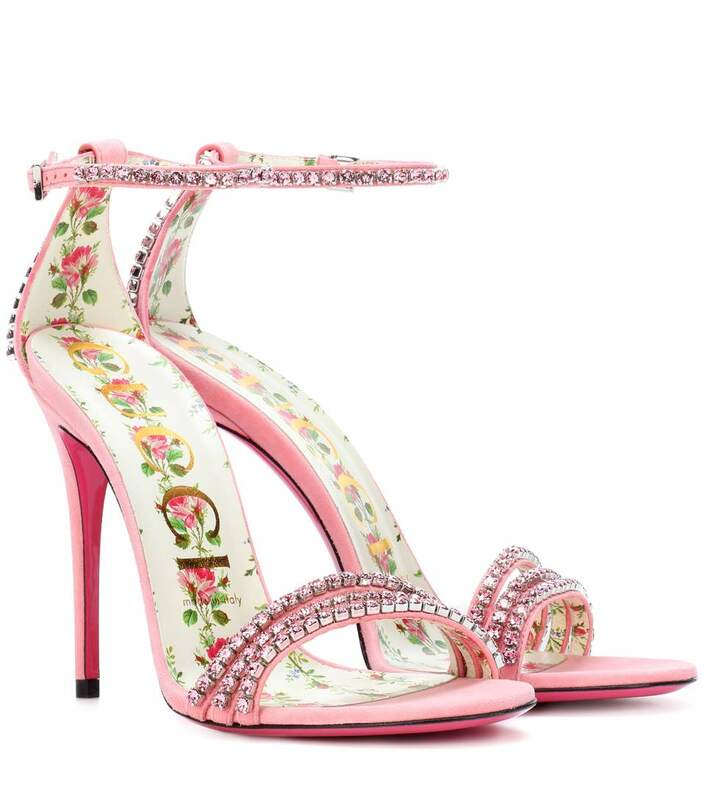 Sophia Webster is the shoe designer, who put cute butterflies to almost all of her shoes. Well, I those are not for me, but I found this amazing Iridessa sandal bootie what have so many crystals and little rocks on it that it's like you are wearing a piece of jewellery. I love this type of bootie, what abut you? The only things I don't like in this brand that they mostly design VERY HIGH heels. I'm 177 cm so I mostly choose mid-heels, and I find them much more comfortable as well but at Giuseppe Zanotti there's not many shoes in the mid-section. I rarely wear black, but I really like this sandal - it looks lovely with the shiny rhinestone embellishment at the middle of it! However I would much more invest in shoes what can be wearable for anything, I have admit that this satin heels looks amazing. 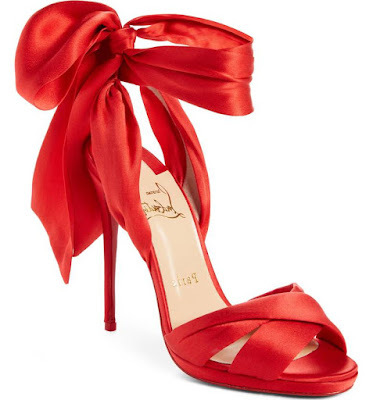 Red, as one of my favorite color looks amazing in this piece, but since I'm 100% sure that this heels are totally unwearable and uncomfy ones, I would buy it for the price of 808 €. But its looks gorgeous!! I love this lacy shoes for a while now - they have this type of products in different heights and in different colors as well, but the most beautiful ones for me are the light pink, the beige and the white colored ones. I think this shoe is very recognizable everywhere and much more prettier than for example Manolo Blahnik's Hangisies. The italian house is not so famous for their shoeline, but this time they designed pretty great ones! This sandal might be a little too much metallic (at least for me) but since I know that most part of it won't be seen if I fit it to myself, I think it's pretty great. 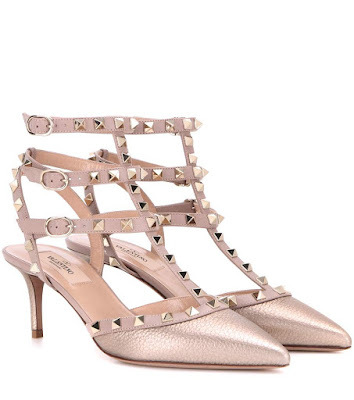 It looks like a metalic Prada version of that pinkish Gucci shoe. Versace is my big-big favorite, but somehow I was never really into their bags or shoes, only their clothes. This time they bringed up a quite iconic shoe silhouette, plus they gave some golden details about it, like the chain. I really like it, for me it looks like a great quality however I'm not sure I would like that little gold Versace clips at the top of it. This half leather-half PVC heels are completely awesome! I would highly recommend for those who are bored by simple high heeled sandals and want to try out the famous PVC trend. I have no idea how much is it comfy or not, but it looks nice. The price is 771 €. I love her! This belgian designer can dress up women like no one else! Her shoeline is not so famous, but she totally created the most perfect golden sandal forever - I love the style, the colour, the look, the heigh and it's also look very comfy. The shoe is 285 €.